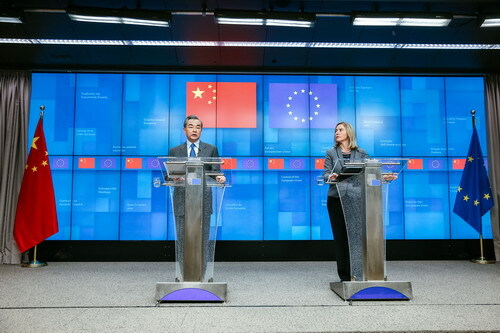 On March 18, 2019 local time, when jointly meeting the press with the European Union (EU) High Representative for Foreign Affairs and Security Policy Federica Mogherini, State Councilor and Foreign Minister Wang Yi expressed that High Representative Federica Mogherini and I firmly believe that China-EU cooperation remains the mainstay, not only in the past, but also at present and in the future. Wang Yi said that since China and the EU are different in history and culture, social system and development phase, it is inevitable for China and the EU to encounter some differences in some issues. With the constant deepening of cooperation, there will be competition in areas such as economy and trade, which is quite normal. Moderate and benign market competition helps stimulate each of us to develop better and makes China-EU cooperation more resilient and vibrant. As China is now making great efforts to push a higher level of opening up and high-quality development, we believe Europe will benefit more from China's new round of reform and opening up and hope Chinese enterprises will be treated in a fair, just and non-discriminatory manner in the mean time. In short, for China and the EU, competition is inevitable while cooperation remains the mainstay and win-win results are the goal. 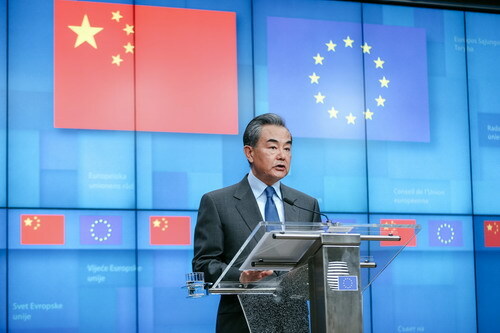 Wang Yi stressed that although the next European elections will be held and a new European Commission will take office this year, China will keep the stability and continuity of its policies towards the EU, and hopes the EU will treat China in the same way. Five years ago, during President Xi Jinping's visit to Europe, both sides agreed to fully implement China-EU 2020 Strategic Agenda for Cooperation and advance the building of the four major China-EU partnerships featuring peace, growth, reform and civilization. This is the strategic choice made by China and the EU, the two major forces, two major markets and two major civilizations in face of the vicissitude of the international situation. It is also the historic responsibility that we should shoulder for the human society. Both sides should join hands to continuously work for it.